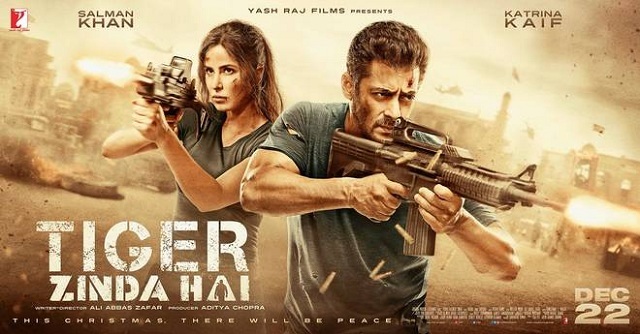 Tiger Zinda Hai 5th Saturday (30th Day) Box Office Collection. Huge Growth Again! Tiger Zinda Hai has shown huge growth again on 5th Saturday (30th day) at box office. Film is still unstoppable and we expect another big growth on 5th Sunday. Tiger registered a growth of around 65% on 5th Saturday from 5th Friday. Film collected an approx 1.25 crore nett on Day 30. Fantastic hold on 5th Friday and now big growth on 5th Saturday has almost ensured that film will zoom past 335 crore nett mark. In fact film is now challenging PK lifetime collection mark. If film retains few good screens from 25th January onward and stands against the might of Padmaavat then it has every chance of going past PK lifetime mark. Tiger Zinda Hai total business currently stands at approx 331.75 crore nett. Film 5th weekend collection is heading towards 3.75-4 crore nett. Film is a huge Blockbuster! Sat - 1.25 crore nett. Total - 331.75 crore nett (approx). Tiger Zinda Hai has The Potential to cross PK's Box Office Collection and It might cross PK's income ... Tiger Zinda Hai Today's (5th Sunday) will be around 1.75-2 crore as per early esitamed ... That is huge growth ..
Lage raho....Aise hi karte raho toh PK jaroor cross hoga..
Bolra tha na is janm me cross nahi hoti ab tu agle janam me Salman ka fan hi banke paida hota. Bhai tumhare dard ko hum samajh sakte hain. But instead of blaming BOI or any other website, Enjoy the success of Secret Superstar at chinies Boxoffice. It is a hilarious. They believe in Secret superstar's articles on its china success by BOI. Infact you people give reference of boi for secret superstar in this website. And when same boi mentions collections of tzh, then suddenly boi becomes a menipulated website. Agar ye fig.cross hoti hai toh mai Sallu ka fan ban jaunga aur Aamir ka bhi rahunga..
Dont give that crap site BOI fig. Yaha PK domestic mushkil hai aur chala 400cr ki baat karne..